A mysterious Navi force has taken control of the Internet!! Now it’s up to Lan and his friends to infiltrate the Dark Chip Factory in the Nebula Headquarters and destroy the Dark Chip production system. The survival of cyberspace hangs in the balance! 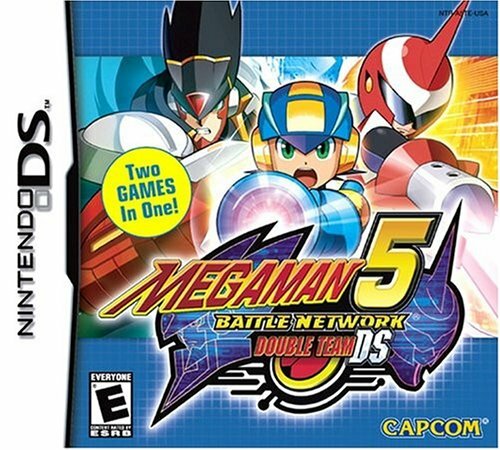 The hit Mega Man Battle Network 5 series blasts onto the Nintendo DS system with the cool features of the original Team Protoman and Team Colonel. Create your own dream team by choosing Navis from both teams! Plus, experience advanced new features exclusive to the Nintendo DS including dual screen PET access, cyber maps and wireless gameplay! Two games in one – play both Team Protoman and Team Colonel versions! Create dream teams with Navisfrom both Teams! Access your PET during gameplay and view cyber maps using the Dual Screen! Head-to-Head battles with up to 8 players using Tournament style wireless play! Cheer Mega Man on with built-in mic and help him win battles!